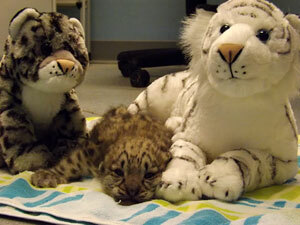 A male snow leopard cub was born at the Zoo on June 1, to 14-year-old mother, Tomiris. This marks the first birth for Tomiris; as the oldest first-time snow leopard mother in captivity. The cub’s father is 15-year-old Genghis. A total of two cubs were born; one at 10:45 p.m., and one at 11:45 p.m. Unfortunately, one of the cubs did not survive. Despite what looked like excellent care from Tomiris, the second surviving cub didn’t gain weight nearly as fast as it should have. Animal care staff considered pulling the cub for hand-rearing, but his weight gain then registered in the normal range. He now continues to average a weight gain of 45 to 50 grams daily. Mother Tomiris continues to show excellent maternal care, and zookeepers are encouraged that the cub will continue to do well. Both Tomiris and the cub remain off-exhibit, where staff can easily monitor them. Watch for the cub to make his public debut in the coming months. Snow leopards are currently listed as endangered in the wild; their numbers estimated between 3,500 and 7,000. They live throughout the mountains of Central Asia in Afghanistan, Bhutan, China, India, Kazakhstan, Kyrgyz Republic, Mongolia, Nepal, Pakistan, Russia, Tajikistan, and Uzbekistan. China contains as much as 60% of snow leopard habitat. The cats have already disappeared from some areas where they formerly lived, such as parts of Mongolia.